Executive quotes in press releases are notorious for lacking any kind of substantial information. It’s the most common place to find fluff in a release, and they tend to be largely ignored. But unfortunately these videos offer little more than a multimedia version of the typical executive fluff. I commend Microsoft’s PR firm Waggener Edstrom for incorporating video content into the release, but it would have been great if the videos had been more substantial. They can probably counter that both videos have had a significant number of views. But that’s all the more reason to make the most of the opportunity. Do the videos add value or are they more executive fluff? Watch and judge for yourself. Where Do You Want Your Social Media Press Releases to Live? They sound too formal. If they would have been informative but NOT like they were reading a press release and had graphics it might be more innovative and well people might want to watch it. Great example, Adam. And you are absolutely right. When videos contain actual news instead of corporate boilerplate, then they get watch and shared. 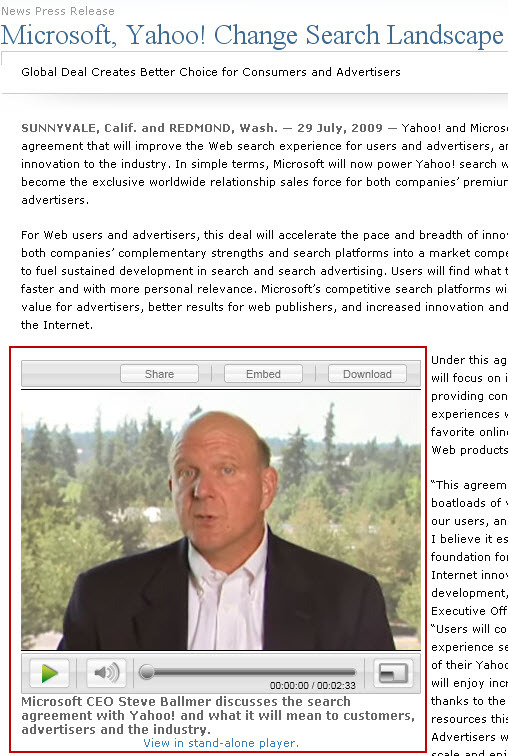 A great example of Video adding to a press release is Jeff Bezos’ speech about the Zappos and Amazon merger. This video really gets across the thoughts behind the merger better than any traditional press release could.